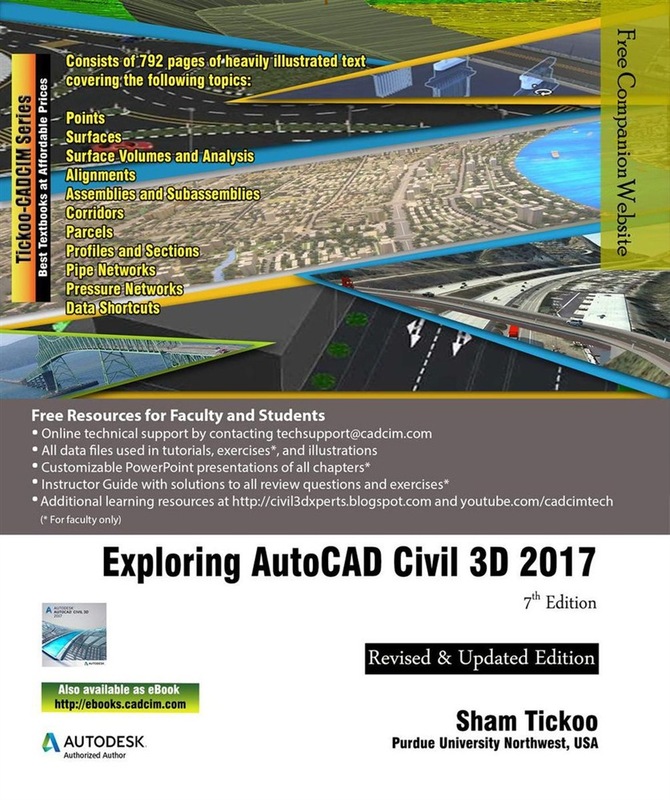 Exploring AutoCAD Civil 3D 2017 textbook introduces the users to the powerful Building Information Modeling (BIM) solution, AutoCAD Civil 3D. The BIM solution in AutoCAD Civil 3D helps create and visualize a coordinated data model. This data model can then be used to design and analyze a civil engineering project for its optimum and cost-effective performance. This textbook has been written considering the needs of the professionals such as engineers, surveyors, watershed and storm water analysts, land developers and CAD technicians, who wish to learn and explore the usage and abilities of AutoCAD Civil 3D in their respective domains. This textbook provides comprehensive text and graphical representation to explain various concepts and procedures required in designing solutions for various infrastructure works. The accompanying tutorials and exercises, which relate to the real world projects, help you better understand the tools in AutoCAD Civil 3D. This textbook consists of 13 chapters covering Points Creations, Surface Creations, Surface Analysis, Corridor Modeling, Pipe Networks, Pressure Networks, and Parcels and so on. The chapters are organized in a pedagogical sequence to help users understand the concepts easily. Each chapter begins with a command section that provides a detailed explanation of the commands and tools in AutoCAD Civil 3D. The chapters in this textbook cover the basic as well as advanced concepts in AutoCAD Civil 3D such as COGO points, surfaces and surface analysis, alignments, profiles, sections, grading, assemblies, corridor modeling, earthwork calculations, and pipe and pressure networks. This edition covers the description of all enhancements and newly introduced tools. 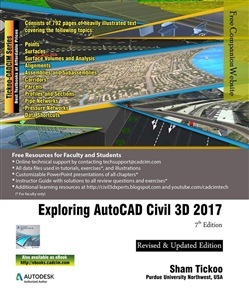 Acquista Exploring AutoCAD Civil 3D 2017 , 7th Edition in Epub: dopo aver letto l’ebook Exploring AutoCAD Civil 3D 2017 , 7th Edition di Sham Tickoo ti invitiamo a lasciarci una Recensione qui sotto: sarà utile agli utenti che non abbiano ancora letto questo libro e che vogliano avere delle opinioni altrui. L’opinione su di un libro è molto soggettiva e per questo leggere eventuali recensioni negative non ci dovrà frenare dall’acquisto, anzi dovrà spingerci ad acquistare il libro in fretta per poter dire la nostra ed eventualmente smentire quanto commentato da altri, contribuendo ad arricchire più possibile i commenti e dare sempre più spunti di confronto al pubblico online.